#1 " Rebellion, Lancers, Whirlwind"
A photograph, complete statistics, collector numbers and a playtip for every figure—common, uncommon, rare, Limited Edition and Unique—from Rebellion, Lancers and Whirlwind. Handy checklists to help players keep track of which figures they have and which they still need. 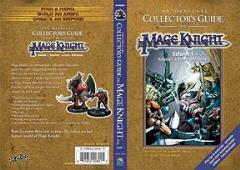 Two short stories, the first Mage Knight fiction ever to see print. Two new game scenarios accompanying each story, available exclusively in this volume. An introduction by Jordan Weisman, co-creator of Mage Knight.